Gamers will need to wait a little bit longer to start playing with Sackboy a second time around. When originally announced, Media Molecule's second turn with Sackboy was supposed to hit shelves this holiday season. Unfortunately, it looks like the sequel to 2008's adorably cheerful make-your-own-platformer is taking a little longer than expected. In a post on the LBP site, Media Molecule said that despite "working like powered-up space ninjas" on the game, the team wouldn't be able to finish by the end of the year - but only barely. The game is now scheduled to hit in January 2011. 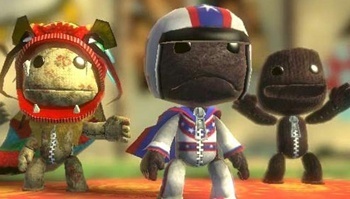 We know this will come as disappointing news for all you LittleBigPlanet fans, and believe us, we are disappointed too. We are a tight-knit team and we take enormous pride in our work, so to raise the bar we've set with the original LittleBigPlanet, a game that has been so embraced by all, we've agreed to allow ourselves a bit more time to deliver the experience that our great fans and community deserve. It's just a game delay, guys. I think every gamer would rather a game come out a few months later and be good than come out earlier and be bad, no?